Male; With high level of personal cleanliness; With related experience, preferably in a hotel industry; With good moral character and trainable; Flexible and physically fit; Must be willing to learn for advancement; Can work on a shifting schedule; At least 1 year work related experience. Male / Female; At least 5’9” in height for Male and 5’7” for Female; Can communicate in English; With pleasing personality; Can work on a shifting schedule; Can handle pressure; With experience in the same field. Male / Female; At least 5’6” in height for male and 5’2” for female; With at least 2 years of relevant work experience; With good moral character; Can communicate well; Able to work on shifting schedules; Capable of handling work pressures. Male / Female; Graduate of any 4 year business course; At least 1 year experience in the related field; Computer literate especially in MS Office applications; With good oral and written communication skills; Can work under pressure; Knowledge in ISO 9001 standard is desirable. Male/Female; BA Degree with Civil Engineer; With 1 year experience or more in construction; Understand about steel structure or construction is an advantage; Be an intermediate user of Microsoft Word, Excel and AutoCAD; Active, enthusiastic candidates who can work independently as well as in group and under high pressure; Ready to go business trips; Goon in English; Good communication and negotiation skills; Willing to work in Makati. At least High school graduate; With at least a working experience on gas station routines; Work oriented; Strong communication and time management skills; Honest and trustworthy. With Bachelor’s Degree in HRM or any equivalent course; With knowledge in inventory; With background on managing and supervising staff; Knowledgeable in MS Office; With at least 2 years experience in hotel operation; Familiar with housekeeping procedures; Familiar with housekeeping Tools and Chemicals; Knowledgeable in gardening. Graduate of any course; With good moral character; Well organized; With at least 2 years experience. 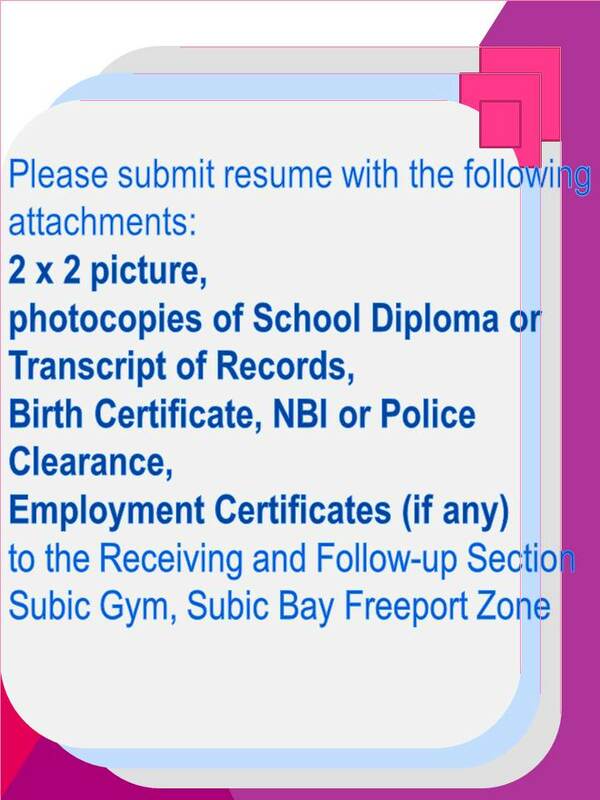 With valid driver’s license; Familiar with the vicinity in Olongapo, Subic, Manila and Quezon City; With at least 2 years experience; Can deal with all kinds of people. Bachelor’s Degree and 1 year experience in Sales, Marketing, and/or business development; Excellent verbal and written communication skills; Demonstrated experience working in sales or marketing team environment; Strong organizational and follow-up skill; Above average desktop computer skills with experience in MS Excel, Word, Power Point and Outlook; Willing to be relocate. Male / Female; Possesses a Degree in Culinary Arts is an advantage; With at least 3 years’ experience in the same position; Possesses effective and efficient leadership skills; Can confidently communicate with all levels of people; Willing to impart knowledge to subordinates for continuing growth in the organization; Adept in Food Safety and Sanitation; Possesses right attitude and professional. High school graduate; With experience; Focus on job, attentive and fast learner. Female; High school graduate; With pleasing personality, jolly, attentive and fast learner; No attitude problem. Male / Female; Must be a Certified Public Accountant; With or without experience; Can work under pressure with minimum supervision; Excellent communication skills. Male / Female; Must be a Registered Nurse; With or without experience; Can work under pressure with minimum supervision. Male; Graduate of any Engineering course preferably Electrical Engineering; AT least 1 year related experience; Knowledgeable in civil and electrical aspects of the building; Excellent communication skills; Ability to multi-task and make good decisions.